Turkey has such a spectacular coastline and you have ample of opportunity to find new routes to cruise. From the Black Sea, Istanbul and the Sea of Marmara in the north via the west coast with Ismir and Bodrum as major hubs to Marmaris, Gocek and Anatalya beautiful cruising waters Turkey is a superb luxury yacht destination. With coastlines belonging to Bulgaria, Romania, Ukraine, Russia, Georgia and Turkey, The Black Sea is a fascinating and unique and new yacht destination with historic, cultural and geographic treasures. 100 km south of the Black Sea coast, lies the City of Safranbolu, it is typical Ottoman city that has survived to the present day. From the 13th century to the advent of the railway in the early 20th century, Safranbolu was an important caravan station on the main East–West trade route and is today listed by UNESCO’s World Heritage list. Istanbul is the largest city in Turkey, constituting the country’s economic, cultural, and historical heart. This vibrant and cosmopolitan city is located at the Bosphorus strait between the Black Sea and the Sea of Marmara. 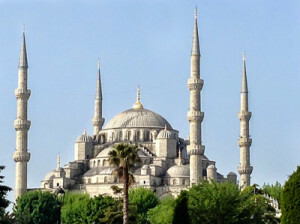 On the north side of the straight you will find the historical center of Istanbul, another UNESCO World Heritage site. This city has Greek and Roman palaces, opulent Byzantine cathedrals and undulating Ottoman domes in a wonderful mixture with world-class shopping and exquisite dining. The first capital city of the Ottoman Empire and birthplace of modern Turkish culture was Bursa on south hillsides of the Sea of Marmara. The mosques of Yesil Cami and Ulu Cami are only two of the architecturally wonders you will find in Bursa. This area is also famous for its healing thermal springs so make sure to visit one of the Turkish baths or hamams. At the south-west border of the Sea of Marmara you find the province of Çanakkale and Gallipoli Peninsula. The channel has been a strategic gateway throughout history for access to the Mediterranean Sea. 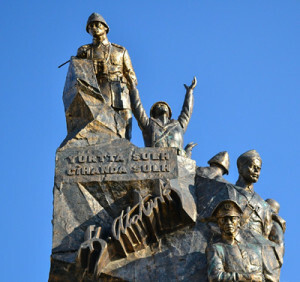 At Gallipoli, ANZAC forces were defeated by Mustafa Kemal Atatürk in Turkey’s first major victory against enemy forces in World War I. The war graves and battlegrounds of Gallipoli are visited by thousands each year on the fated anniversary of the landing of Australian and British forces at Anzac Cove and is today a national park. Further south as the Sea of Marmara meets the Aegean Sea you have the shores of famous Troy with its archaeological site, today listed as a World Hertitage site by UNESCO. South-west of Troy you find the island of Bozcaada, a getaway with beautiful landscape and heritage in winemaking and a annual wine festival. Further south-east following the rocky shores of the Biga peninsula (or Troad) you find the Adramyttian Gulf and picturesque Behramkale and the ancient City of Assos. Visit the remains of the Temple of Athena and the spectacular amphitheatre overlooking the Aegean Sea. The city of Assos was founded from 1000 to 900 BC by Aeolian colonists from close by island of Lesbos. In the mountains east of the picturesque costal town of Dikili, by the lake of Kestel Baraji and the city of Bergama, the achilogical site of the Acropolis of Pergamon resides, yet another of UNESCO’s World Heritage sites. Pergamon was the capital of the Hellenistic Attalid dynasty, a major centre of learning in the ancient world and later it became the capital of the Roman province of Asia known for its Asclepieion healing centre. Further south the metropolitan City of Izmir, a major port and third largest city (population) in Turkey. 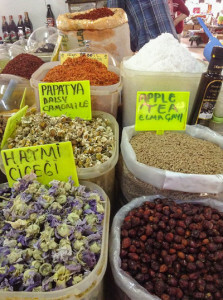 In the heart of the city the pulsating and vibrant market of Kemeraltı Bazaar is a must for any traveler. Here is the place to find your leather goods, clothing and jewellery. 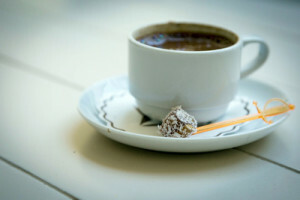 Indulge in the hustle and bustle whilst enjoying a Turkish coffee with a baklava or Turkish delight. Within the main bazaar you will find the city’s largest mosque, Hisar Camii. At Izmir’s harbour be sure to view the Saat Kulesi (Clock Tower). This beautiful marble tower was designed by Levantine French architect Raymond Charles Père in 1901 and reaches 82ft in height. The sea-front promenade, the Kordon and the downtown area is known for its nightlife, live music and restaurants and at the southern end of the Kordon you find the new Arkas Art Centre. West of Izmir you the beaches of Çesme will entice you. With it’s clear waters and consistentm stung winds this is the Turkish center of wind and kite surfing. 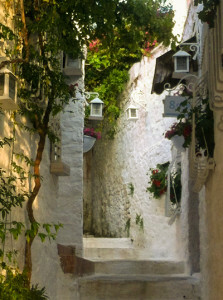 The picturesque village of Çesme Alaçatı is known for its architecture, vineyards and windmills and well worth a visit. Rounding the Çesme peninsula, passing east of the Greek island of Chios we travel south east towards the beaches of Kuşadası. Famous for crystal clear waters these wide sandy beaches are a heaven for the sun lover. Inland of Kuşadası you find the ancient city of Ephesus (also Ephesos). According legend, Ephesus was founded by the tribe of the Amazons, great female warriors. 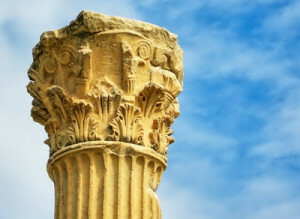 Famed for the Temple of Artemis the city was built in the 10th century BC. While Carians and Lelegians were among the city’s first inhabitants, Ephesus is mostly known as a Ionian Greek since the early Ionian migrations and the city flourished after it came under the control of the Roman Republic in 129 BC. The Temple of Artemis was a Greek temple dedicated to the goddess Artemis and is one of the “Seven Wonders of the World”. 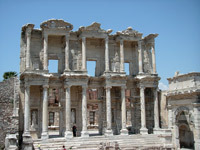 It was was destroyed or damaged in a raid by the Goths in 268 AD later rebuilt before it’s eventual destruction in 401. Only foundations and sculptural fragments of the latest of the temples at the site remain. Dilek Peninsula National Park, situated on the south of Kusadasi on the Dilek Peninsula and east of the Greek island of Samos. The area covers 10.985 hectare and has extraordinary beauty, a superb luxury yacht charter destination. In the north western end of the Gulf of Gökova you find the city of Bodrum and the Bodrum peninsula. Once a quiet fishing village called Halicarnassus, Bodrum is today a popular tourist destination with a glittering marina, boutiques, sumptuous restaurants and happening nightlife. Sometimes referred to as”The St Tropez of Turkey” the city’s charming alleyways offers more than just brilliant sun, sand and sea. The remains of the Mausoleum of Mausolus – one of the Seven Wonders of the Ancient World, the Uluburun a late Bronze-Age shipwreck, preserved within the Castle of St. Peter, and much ore will keep any history buff busy. Gulf of Gökova is the narrow gulf of the Aegean Sea between the Bodrum peninsula and Datça peninsula in south-west Turkey. From Bodrum and Greek island of Kos in the west, Akyaka in east, Datça and Marmaris peninsula in the south the bay is perfect cruising grounds for your luxury yacht charter and the beginning to the Turkish Riviera. 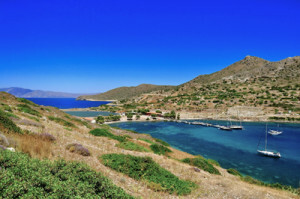 The Datça peninsula’s coastline is long outlined with small bays and coves and a haven of yachting and beach combing. At the peninsula’s most western tip lies the debatably the location for the ancient city of Knidos. Here you have a good view of the Gulf of Gökova in the north and the Gulf of Hisarönü in the south. Port of Marmaris, lined with local gullets, yachts and luxury vessels alike is a perfect start of your yachting holiday. Make a visit to Marmaris Castle, reconstructed by Süleyman the Magnificent is estimated to be 5000 years old before you visit the fresh vegetable open market and go shopping in the Marmaris bazaar or just explore the intricate pattern of streets, steps and alleyways. Marmaris National Park is the site of the ancient cities of Physkos (Marmaris) and Amos (Hisaronu), which used to be called the Caria region and still has evidence of the colony of Rhodes. In Amos, there are the remains of a theatre, a temple and sculpture pedestals, which are surrounded by city walls. The Physkos walls date back to the Hellenistic age. Within the national park you will find red pine, oak, plane tree, sweetgum trees, cypresses, wild olive, oleander and laurel forming a beautiful landscape. A popular stop for a luxury yacht charter cruise is Kumlubükü. Here you can enjoy a sumptuous meal at Kumlubükü Yacht Club. East of the Marmaris, above the today’s river town of Dalyan you find the Carian city of Kaunos and it’s Acropolis (Persikon), the 75m (diameter) amphitheatre (built to serve 5000 spectators), Roman baths and the fascinating Kaunian rock tombs – Tombs of the Kings. This archaeological site is listed tentative by UNESCO. Göcek is located east of Marmaris and the airport of Dalaman and is a perfect place to start or end your yacht charter. 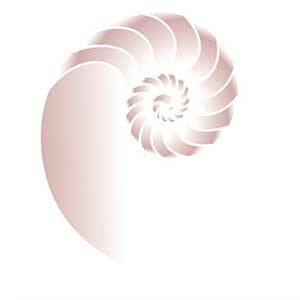 Today the bay host a number of upmarket marinas serving the luxury yachting industry. Göcek itself once a small village has a number of splendid restaurants and shopping possibilities. Further on the East Coast the City of Fethiye. 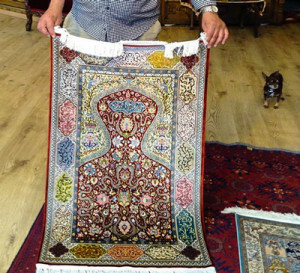 A hustling, bustling coastal city with ample of opportunity to find that carpet, leather jacket, spices or other Turkish delights. 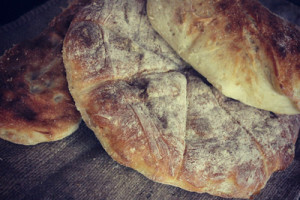 Fethiye is located where once the ancient city of Telmessos was situated. Ruins can be seen by the Hellenistic theatre by the main quay. According to legend, Alexander the Great was on a mission to invade Anatolia in the winter of 334–333 BC and entered Telmessos harbour with his fleet. Nearchus, the commander of the fleet, asks permission of King Antipatrides of Telmessos for his musicians and slaves to enter the city. Once inside, the warriors with weapons hidden in the flute boxes capture the acropolis during the feasts held at night. Beyond legends, visit the Fethiye Museum, for the ancient and more recent artifacts, displaying a successive chain of civilizations that existed in the area, starting with the ancient Lycians. The Tomb of Amyntas, a large and beautiful tomb built in 350 BC by the Lycians with beautiful and large carvings also worth a visit. Saklikent National Park is located approx. 40km east of Fethiye and north of Kas. The area was decalred as a National Park in 1992. In it’s center a fascinating and mystic canyon. To hike up the canon with crystal clear and chilling water on a hot summers days is truly a beautiful contrast to endure and enjoy. 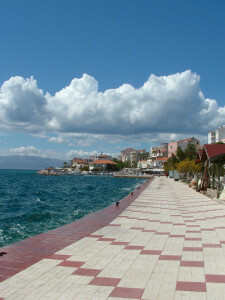 Further on the beaches of Öludeniz is a popular tourist destination. Below you will find a few sample itineraries that might be of interest. Transfer from Dalaman Airport to embark yacht in Marmaris at BASE PARADISE. 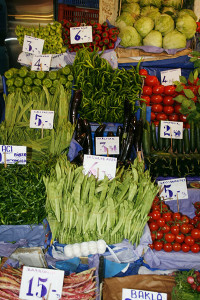 Marmaris is one of the most popular summer resorts of Turkey. The most important historic building in the town centre is Marmaris Castle. Many bars and restaurants are spread in the Marina. It is, at the same time, quite a full-fledged shopping centre. The night spent in a small, quiet bay nearby the town. Sightseeing tour in Marmaris then sailing onward to Caunos (Dalyan), visiting the Carian city Caunes, its famous rock-tombs and well-known beach. Enjoy the fascinatining and beautiful sands of Iztuzu Beach known as the breeding ground of Caretta – Caretta sea turtles. A short sail to Gocek Laguna-Anchorage at Sunken Bath. 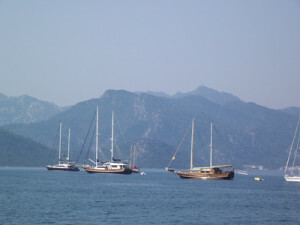 Gocek is a favourite bay for yachts and the Blue Cruisers. The crystal-clear water invites everyone to swimming and snorkelling. 7 miles away from Gocek there are seven small islands called Yasl calar real natural beauties with fine sandy beaches. Sail to Fethiye. If all the cities and the seas were to be known by a colour, turquoise-blue would definitely suit Fethiye. And the most beautiful tone of this blue can be seen in Oludeniz (Blue Lagoon). You can enjoy hours of swimming, snorkelling and hiking here. A short land trip will take you to Kaya Village “The old Greek Ghost Town”, “Karymylasses”, rock-tombs, mosques, Turkish Bath and Bazaars. Night spent in one the beautiful bays of Fethiye. 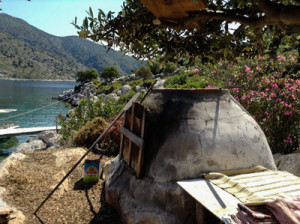 Early in the morning sailing to Gemiler Island – hiking to Lycian and Byzantine dwelling and ruins. Here one can swim, dive, surf and fish to one’s heart’s content. Spending the night in a lovely small cove surrounded by pine and olive trees. After having breakfast sailing to Sarigerme. Its back is leaning against the pine trees; in the front is a long beach with fine sands and shallow, warm and clean water. Just off the shore is Baba Ada that serves as a natural breakwater. This island is one of the best places for swimming and playing with the huge array of water toys on board. Dinner and night spent here. Enjoy cruising before return to Marmaris, Base Paradise. Disembarkation from the yacht and transfer to the airport. Embarkation to the yacht in Bodrum. 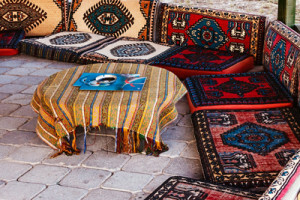 Bodrum is one of the most popular resorts of Turkey famous for its beautiful bays, vivid entertainment life, vast choice of shopping and eating-out varieties. The Medieval Bodrum Castle and the Underwater Archeology Museum worth a visit before you start your cruising on board your yacht. Sailing to the Gulf of Gokova. The Sedir Island, also known as Cleoptra’s Island, the English Harbour, Cat Bay are among the most favorite anchorages in this big gulf. 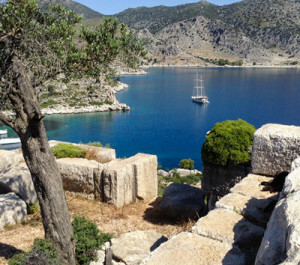 Knidos – Knidos was one of the major trading Dorian city before & during the Hellenistic times. It was famous for the naked statue of Aphrodite made by the famous sculpturer Praxiteles. Today the ruins of the city can be visited. Palamutbuku bay is an ideal anchorage for that night. Datca is the only town in this route except Bodrum. It has a cosy & local atmosphere with its small town center and marina. You can do some shopping, exchange money, buy naturel olive oil soaps and enjoy a concert in the open-air theatre in the evening if you are lucky. Orhaniye & Selimiye are two beautiful villages & bays in the Hisaronu Gulf. The sea is crystal clear, bays are quiet and ideal for all watersports in this area. Bozburun is our last stop before we steer back to Bodrum. Sailing back to Bodrum. Last day is spent in a bay close to Bodrum to enjoy the beautiful sea and do some water sports. 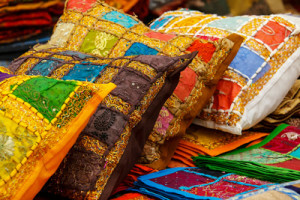 If you wish you may spend the last night in Bodrum to do some shopping and to enjoy the night life. After having breakfast on board, time for disembarkation in Bodrum. This area is known for it’s Gulets and they are superbly adapted to cruising this area. Embarkation to the yacht in Gocek Harbour. First day is spent in Gocek Gulf and depending on the time of arrival to the yacht, one or two different bays can be visited to enjoy swimming, sunbathing and relaxing in one of the most best cruising areas of the world. Dinner and night spent in Gocek. Gocek – Gemiler Island (15 nm, 2 hrs) After breakfast, sail through the islands on to Gemiler Island. You can discover both the underwater and on land ancient ruins in this area. Oludeniz, which is may be the most famous beach of Turkey, can be visited by the tender. Gemiler Island – Kalkan (35 nm, 4 hrs) After an early start from Gemiler Island, you will arrive to Kalkan. Kalkan is a small seaside town with steep streets bordered by shops, cafes and old-style buildings. The ones interested in history & archaeology, can take a land tour to see the ancient Lycian cities of Xanthos, Letoon and Patara. Kalkan – Kekova (28 nm, 3.5 hrs) In Kekova area, the Sunken City, Simena and Ucagiz can be visited. In the Sunken City, near Kekova Island, the water is so clean that you can easily see the buildings under water. Simena, is the ancient settlement around today’s Kalekoy and the ancient fortress crowning the hill, has a breathtaking view. 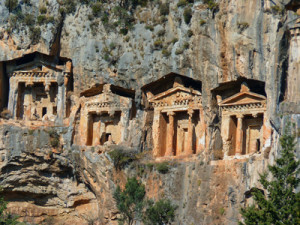 The Lycian-type tombs are scattered all around the area. Kekova – Kas (13 nm, 1.5 hrs) * Diving area * After breakfast cruise for the delightful seaside town of Kas. (If desired Castellerizon, the small Greek Island just opposite to Kas can be visited as well). Kas – Oludeniz (48 nm, 6 hrs) Your boat will get under way very early in the morning. On the way you may stop by Seven Capes (Yedi Burun) for swimming and lunch. 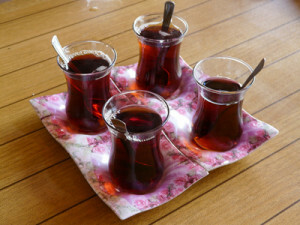 In the afternoon you will be in Oludeniz. The ones interested in can take a tour to Karmylassos (the Ghost Town), the abandoned Greek town behind the hills of Oludeniz. Oludeniz – Gocek (15 nm, 2 hrs) Last day of the holiday will be spent in the Gocek Gulf, visiting different bays for watersports and swimming. 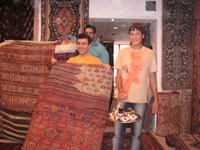 In the evening, you may enjoy the cosy town of Gocek and do your last shopping. 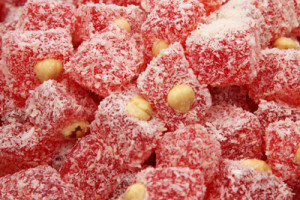 Konya, Milas and many more..
Find more East Mediterranean information and itineraries here.